Is there a limit to the amount of AdGroups in one Campaign? Each campaign can have up to 20,000 Ad Groups. What is a good CTR? Does my spend affect my CTR? In general, we consider a good CTR (click-through-rate) to be 1 percent or above on the Search Network. On the Display Network, users are generally at a different point in the buying cycle and, therefore, we expect a much lower CTR. To evaluate the performance of your Display ads, you may want to look at the Relative CTR metric. What are the top 10 things one can do to improve their Quality Score? Really, the thing to focus on here is ensuring that you have good account structure and that your keyword lists are tightly themed and highly relevant to your ad text and your landing page. Focusing on CTR, which is a large part of Quality Score, can help too. I noticed my quality score changes from day to day. Should I only be reviewing my score weekly or monthly before making changes? Quality Score is a dynamic metric that is actually calculated each time your ad is eligible to enter the ad auction. The score that you can view next to your individual keywords is basically a snapshot estimate of how relevant your ads, keywords, and landing page are to a person seeing your ad. While Quality Score is an important metric, we’d suggest focusing on some of the other metrics we also covered in the Hangout, like CTR, average position, and conversion tracking. Do you suggest eliminating all keywords/ads that don't produce conversions over a six month period? It totally depends on your goals. If, for example, your main advertising goal is to drive conversions and you notice some keywords have been in your account for a while but aren’t helping you achieve your goal, you might consider pausing or deleting those keywords - particularly if you’re paying a lot for those clicks. Will your keywords with different match types "fight" against each other if they both qualify for the impression? Essentially, yes. In determining which keyword enters the auction, the AdWords system is going to try to match the keyword that most closely matches the user’s query, but it will also factor in which keyword will be cheapest and get the highest ad position. It’s not necessary to have all the match types for every keyword in your account. When choosing a match type, think about how users might conduct a search for your business or services, then choose which match type (broad, broad match modifier, phrase, exact) would allow for the most number of users to be able to find you for relevant searches. You can read more about the main keyword matching options here, and about the broad match modifier option here. If I had drawn a custom shape before that feature was removed is it possible that I am still targeting that area (the account still shows I am)? Location targeting by custom shape is no longer supported. If you didn’t select specific targeting areas other than the custom shape before we sunset the feature, the AdWords system would have used your custom shape to match your campaign to the targeting areas (cities, metro areas, states, countries) that best match the area within your previously selected shape. How do I target just five states? I see most of our sales coming from just these five. I would like to see if that increases my sales. Within your AdWords account, you’ll want to navigate to the Campaigns tab at the top and then select the specific campaign. Then, on the gray Settings tab for that campaign, under the “Locations and Languages” subtitle, there is a “Locations” section. By clicking the blue Edit link next to “Locations” you can then select specific states (or cities) to target. To learn more about how to get started with AdWords, visit our Help Center or check out the AdWords Community forum. And remember to tune in to the live stream of our next Hangout at 11 a.m. PDT Wednesday April 4, when we discuss how to get started on Google Places. We’ll be collecting your Places questions early next week on the Google+ Your Business page.
. Whether you’re just getting online, interested in marketing, or itching to do more, Learn with Google can help. On the site you’ll find videos, how-to guides, and worksheets, all of which will help you effectively promote your business online. Here’s an example of the types of resources you can find at Learn with Google. This video shows you how to connect with local customers online. When you’re done with the video you can download the worksheet, which will walk you through the process to start reaching more customers in your area. Business owners want to understand how online search and marketing works, and make sure they’re getting the most out of the efforts they put in. With that in mind, we’re excited to introduce you to Learn with Google. Whether you’re just getting online, interested in marketing, or itching to do more, Learn with Google can help. On the site you’ll find videos, how-to guides, and worksheets, all of which will help you effectively promote your business online. Yifat: If a business page doesn't have many followers and they open a public Hangout, where does it appear and can anyone join (even people who haven't circled them yet)? A notification to join the Hangout appears only to those who have added the page to their circles (they’ll see it in the Stream), but anyone with the link can join the Hangout. Thorben: Are you still planning on making Hangouts On Air available for everybody? We’re definitely still hoping to make this more widely accessible. Thanks for being patient! Nadra: I'm looking forward to using Hangouts for event promotion. I'm curious about the different nuances of launching Hangouts before, during and after an event. Hangouts are a great way to give others insight into an event, especially during the live show (be sure test the sound quality ahead of time to make sure everything’s a-OK). Before an event, you could use the Hangout to start building interest by giving sneak previews to guests, and after the event, use a Hangout to recap the highlights and showcase follow-up interviews. Eric: How can we embed Hangout info on our website? And help people to pre-register? Can we stream the live Hangout to another web property like our web site? Embedding a Hangout and streaming on your own web property aren’t possible at the moment, but it’s a common feature request that we get from users and one the team is aware of. As for pre-registering, you can ask the followers of your page to leave a comment if they’d like to be invited to attend, or create a Google form to collect the names of participants. Barbara: I've been using Hangouts quite a bit but even in smaller groups we've struggled with disturbing noise interferences we couldn't really explain. How can we overcome such seemingly mundane but important difficulties? Make sure you have a dedicated quiet room for participants in the Hangout. Use microphones and headphones to improve sound and audio quality, and ask participants that when not speaking, hit the “Mute” button at the top right of the Hangout screen. To learn more about how to get started with Google+ Hangouts, visit our Help Center. And remember to tune in to the live stream of our next Hangout at 11 a.m. PDT Wednesday March 28, as we discuss how you can help the right customers find your business with AdWords. We’ll be collecting your AdWords questions early next week on the Google+ Your Business page. : This is the sixth in a series of posts about small businesses on Google+ and their tips and tricks for managing a great page. Visit our YouTube channel to see all the videos in this series and join the discussion on the Google+ Your Business page. What’s a Hangout On Air? Well, Hangouts are a video group chat with a limit of 10 participants. Hangouts On Air are special Hangouts that allow you to broadcast that 10-person Hangout to many people and record it for future viewing. Why, as a business owner, should I use Analytics? Kenneth: Is there a threat in respect to data privacy? We take privacy very seriously at Google. The only person that has access to your Google Analytics data is you. You can also grant other people access to your Analytics data, but that’s up to you. Martynas: Is there a plan to update the administration part of GA? We need more levels: creator, administrator, manager, reader. Lea: When oh when will export to PDF be available in the new version of Analytics? We hear you! It’s coming back very soon. We’re sorry it’s taken so long to add this feature to the new version of Google Analytics. Jeremy: What are the plans for integrating Google Analytics with Site Optimizer? Connie: Is there a good WordPress plug-in for adding GA code to a blog? Raphael: Can you tell us more about the benefits of using Analytics for tracking mobile apps? You can absolutely track apps with Google Analytics. We have two SDKs, one for Android and one for iOS, that make it easy to track how people use an app. If you’re going to use GA to track apps you should also understand Event Tracking and Custom Variables. These two features are very useful when tracking apps. Justin shows us a feature that tells you how often you show up in Google’s organic search results and the number of click-throughs that you get. To learn more about how to get started with Google Analytics, visit our Help Center. And remember to tune in to the live stream of our next Hangout at 11 a.m. PDT Wednesday, as we discuss how to use Hangouts (something a bunch of you guys have asked us to talk about!). We’ll be collecting your Hangout questions today on the Google+ Your Business page. You’re looking to grow your business, and we offer a ton of tools to help you do just that. But sometimes, you need a little help learning all the options and getting started. That’s why this week on the Google+ Your Business page, we’ve launched a new series of Help Desk Hangouts On Air to put you in touch with teams who can help you get the most out of our products and features. : This is the fifth in a series of posts about small businesses on Google+ and their tips and tricks for managing a great page. Visit our YouTube channel to see all the videos in this series and join the discussion on the Google+ Your Business page. 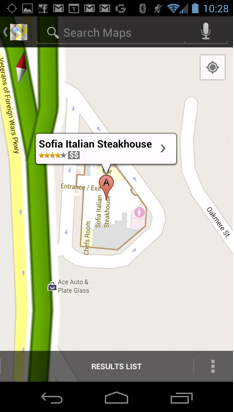 , a Google Maps feature now available for Android mobile users, shows detailed building floor plans where available. This helps your customers using Android phones figure out where they are and what’s around them in your shop, and enables new customers to check out the layout of your location before they even visit. Indoor maps were initially released with a limited set of partners (mainly large retailers, airports, and transit stations), and now we’re looking to bring these maps to more places where users might benefit from being able to quickly see floor plans labeled with ATMs, restrooms, departments, and more. You can upload your venue’s floor plan to the Google Maps floor plans tool (make sure you have the necessary permissions and follow our content guidelines). If accepted, we’ll format it to appear on Google Maps for Android. Your floor plan can be a blueprint, a digital image from your website or a brochure. If you only have a physical copy of the floor plan, you can scan or take a picture of it and use that image instead. Easy! If your store is located within a larger indoor space, you’re still able to participate. Talk to your property manager or building owner about uploading a floor plan, since improved and more detailed information can help all the businesses in your establishment. Google Maps helps you orient yourself in the world around you, and as of a few months ago, began to help you do this indoors as well. Indoor maps, a Google Maps feature now available for Android mobile users, shows detailed building floor plans where available. This helps your customers using Android phones figure out where they are and what’s around them in your shop, and enables new customers to check out the layout of your location before they even visit. : This is the fourth in a series of posts about small businesses on Google+ and their tips and tricks for managing a great page. Visit our YouTube channel to see all the videos in this series and join the discussion on the Google+ Your Business page. Meet Loluma, a team of artists that designs one-of-a-kind events. Sha Sha Harnik leads the team, as they provide design direction and coordination for wedding and event clients. In the video below, see how she uses Google+ not only to create moments, but also to capture and share them with her wedding clients. Google+ Hangouts allow you to collaborate through group video chat. Watch Sha Sha hangout with a family of stealthy birthday planners to help them create the ultimate surprise party for their grandma’s 80th birthday. Share your screen. With screen sharing, you can let other Hangout attendees see what’s on your screen. Want to share a website with your colleagues, or a design you’re working on with clients? Just select the “Share screen” button at the top. Collaborate on documents in real time. You can share notes and even work on documents at the same time. Perfect for brainstorming sessions! To get started, select the “Start a hangout” button on the navigation bar along the right. In the yellow bar at the bottom of the pop-up window, select “Hangouts with extras,” and get started! Want to learn more? Visit the Google+ Your Business site, and stay tuned for more Google+ stories and tips from small businesses. How do you use Hangouts to collaborate with your co-workers and customers? Join the discussion on the Google+ Your Business page and tag your posts #mybusinessstory. Editor’s Note: This is the fourth in a series of posts about small businesses on Google+ and their tips and tricks for managing a great page. Visit our YouTube channel to see all the videos in this series and join the discussion on the Google+ Your Business page. At Google, one of our goals is to help make the web work for your business. Today weíre introducing the Learn with Google webinar program that does just that, by sharing best practices and tips across a variety of products, including search ads, mobile ads, display ads, YouTube and Google Analytics. Check out our new webinar page to register for any of the sessions or to access on-demand webinars. Weíll be adding new webinars as theyíre scheduled, so check back regularly for updates. You can also stay up-to-date on the schedule by downloading our Learn with Google Webinar calendar to automatically see upcoming webinars in your Google Calendar. Whether your goal is to engage the right customers at the right time, make better decisions faster, or get the most from your marketing dollars, we hope that youíll use these tips and how-toís to maximize the impact of digital and grow your business. Weíre looking forward to having you join us!